1/16 Tow cable shackles for Panther and Tiger Tanks Discounts Apply ! 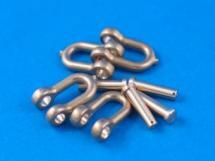 Panther, Jagdpanther, Jagdtiger, King Tiger and Tiger I 1/16 Tow cable shackles. Will fit all other German 1/16 scale tanks. Great for any large armored tank that needs that extra detail. 4 shackles per package.